Recently the Gunnison High School Student Leadership Committee, Gunnison High School volleyball teams, Western Colorado University volleyball team, and Tric Salon came together to raise money to support local women in the valley in their fight against breast cancer, raising over $900 that they donated to Cattlemen’s Days Tough Enough to Wear Pink. The volleyball teams promoted a bake sale and raffle while the Student Leadership Committee had a beautiful lunch spread outside. Tric Salon was there placing pink tinsel in the hair of anyone that wanted it. Best of all in an emotional hair cutting ceremony between the GHS volleyball games, 17 girls donated their hair, inspiring three of the girls from Aspen to donate hair as well! 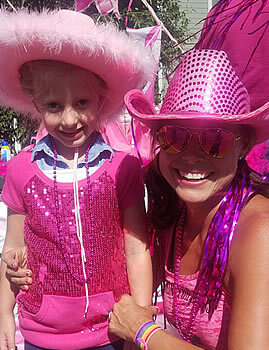 Cattlemen’s Days Tough Enough to Wear Pink would like to thank everyone that helped and all of the generous donors. It’s so amazing to see the community come together to help lift up others in our community. Special thanks go to GHS volleyball coach Shana Benson and Western volleyball coach Jessica Fey and their assistants for putting everything together for the matches and TETWP donations. We are continually inspired by this great community and its support of TETWP!